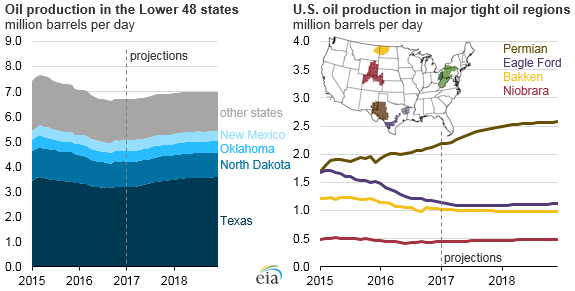 In EIA’s January Short-Term Energy Outlook, U.S. crude oil production is forecast to increase from an average of 8.9 million barrels per day (b/d) in 2016 to an average of 9.3 million b/d in 2018, primarily as a result of gains in the major U.S. tight oil-producing states: Texas, North Dakota, Oklahoma, and New Mexico. Of these states, Texas and North Dakota will continue to be the largest producers of crude oil because of the large amounts of economically recoverable resources in the Eagle Ford, Permian, and Bakken regions. Production in Texas, the largest oil-producing state, is driven by two major oil-producing regions, the Permian and the Eagle Ford. As defined in EIA’s Drilling Productivity Report, the Permian region makes up a large geographic area with producing zones each more than 1,000 feet thick and with multiple stacked plays. Because of its large geographic size, the Permian offers a lot of potential for testing and drilling, and the multiple stacked plays allow producers to continue to drill both vertical wells and hydraulically fractured horizontal wells. Compared with the Permian region, the Eagle Ford region has fewer overall drilling opportunities in core areas. The Eagle Ford region has a significantly smaller geographic area than the Permian region, and the region's target producing zones are only about 200–300 feet thick, compared to the thousands of feet within the Permian. As with most shale and tight oil regions, the Eagle Ford region has wells with high initial production rates, but faster than average production rate declines. Because of these production rates, drilling fewer new wells has a more immediate effect on production. As low oil prices slowed the pace of drilling, production in the Eagle Ford region has declined since March 2015, with average annual production at 1.6 million b/d in 2015 and 1.3 million b/d in 2016.